DHC: Girls just want to have fun. What’s better than beauty tips from your friends? Whether you’re a strict minimalist or a product junkie, women love to trade beauty secrets with each other … let’s start talking! 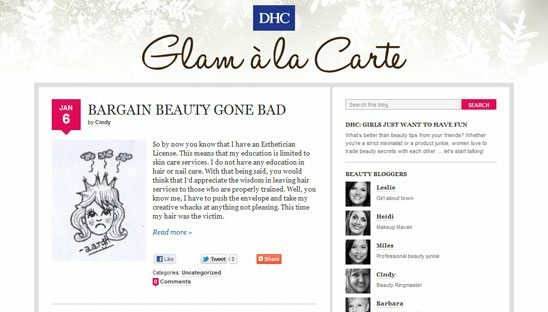 We were hired to develop and code the DHC wordpress blog. All the designs were supplied for us to code. Couple cool additional features that we coded was the video gallery slider located in the sidebar, you can scroll through the video thumbs and when you click on one a lightbox pops up. Another feature is a custom photo slideshow that pulls from the post media image folder along with the image captions and descriptions. The best part of the slideshow is that it scales in height depending on each image height and how much copy is inputted into the description field.